Color: Body: Walnut matte Fronts: Bordeaux (burgundy) high gloss or Violet high gloss or Black high gloss or White high gloss // Description: 1. 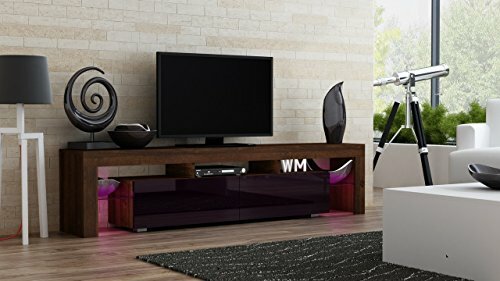 TV stand MILANO 200 - Overall H/L/D 17,72"/78,74"/13,78" - fronts in various color combinations - high gloss, two front doors (27,56" wide and 9,84" high each). Touch TIP-ON opening system (no handles). Open spaces for media equipment - 2x~H/W/D 3,54"/14,96"/12,6" and 1x~H/W/D 3,54"/23,62"/12,6" (there is an additional ~2,56" space behind the front upper shields). On both sides two additional glass shelves (width 11,02") with remote controlled LED lighting system - ON/OFF and 16 color selection Remote Control. // DIMENTIONS L/D/H ~78,74"/13,78"/17,72" cm // Modern and unique design. Easy to install with pins and eccentric type connections. Clear visual assembly manual. 16 color LED lights with remote (palette of 16 RGB colors with remote control, e.g. : red, green, blue, turquoise, violet, yellow, warm and cold white and etc.) // Brand New / Flat-Packed / ready to assemble with easy to follow instruction manual. Material / finish: Particle board laminated on both sides - 0,63 inch thick and PVC veneer of 0,024 inch. Fronts made of MDF board - all sides in the same color and covered with high gloss acrylic 0,08" PVC. Back panel made of HDF. Fronts opened by touch "TIP-ON" system (no handles). If you have any questions about this product by Concept Muebles, contact us by completing and submitting the form below. If you are looking for a specif part number, please include it with your message.